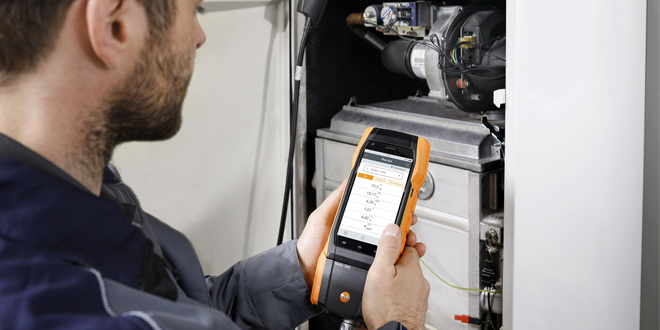 The most conspicuous feature of the new testo 300 is the large 5” Smart-Touch display. It allows especially intuitive operation – just like a smartphone. All measurement values can be seen on its 5” HD display as graphs, or table. Clearly structured menus for all applications involving heating systems are stored in the testo 300, including the following measurements, among others: Flue gas, draught, ambient CO, tightness & letby, differential pressure, differential temperature, and O2 air input. Measurement reports containing all information on measurement values, customers address, and site details can be created directly on site with the testo 300. It is also possible for the user to include his own comments. The customer confirms the work of the technician with an electronic signature directly on the touchscreen of the testo 300. You can send reports to the office or customers straight away via wireless LAN. They are also stored in the instrument for archive purposes. The testo 300’s high-quality and resilient construction allows it to withstand the tough working day. Its scratch-proof display is countersunk and equipped with an exchangeable protective film. Four magnets, believed to be the strongest in the industry, ensure secure attachment. Kits using Testo long-life sensor technology together with automatic dilution of measured flue gas allow measurements up to 30,000 ppm CO without instrument damage. Another benefit of the long-life sensors is an expected working lifespan of 6 years which compared to other analysers can save the cost of a set of sensors across a typical 5 year working life. Testo 300 is available in kits for Domestic or for Commercial boilers. The Domestic kits come with standard life sensors and various accessories all in a new soft case. Commercial kits are fitted with long-life sensors and supplied in industrial hard cases. The Commercial kits also have the option to add a third sensor slot for the measurement of NOx. Depending on the model chosen, customers enjoy two or four years’ warranty. Customers who register their instrument at www.testo.co.uk receive one year warranty extension free of charge. Testo 300 is independently tested to EN50379 and meets the requirements of BS7967:2015.